All of our chai blends are made in-house and are formulated by tea mixologist Mac Rebant and certified clinical herbalist Lindsay Lund. By far one of our most popular teas, Shavano Spice is the original chai made here at Vital Living. We've taken it further and have added rooibos, green tea, and yerba mate to the original spice mixture for other yummy chai's to enjoy! 1 ounce of our chai blends will brew approximately 3 - 4 cups of tea. Warming, spicy, sensuous, silky smooth, and exotic. This spicy chai blend is our Shavano Spice minus the black tea so you can add it to any of your favorite teas to add that extra bite and flair, or enjoy a cup by itself when you need a lift and want to warm up without any caffeine. Perfect before yoga, or as an after dinner digestive tea. This blend is great for any occasion. Invigorate and bliss out! Ginger*, Cinnamon*, Cloves*, Cardamom*, Orange Peel*, Cocoa*, Colorado & India Grown Chilis, and a tiny pinch of Black Pepper*. 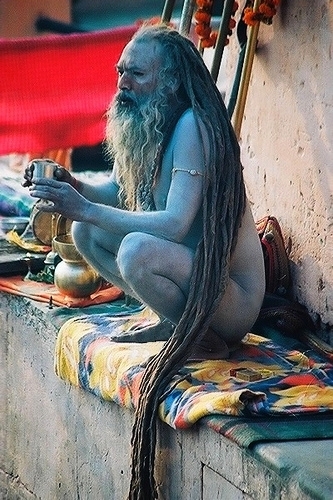 A sadhu enjoying the open breeze and a nice cup of chai.